This wheel has been used as a shop window prop in a knitwear shop. The previous owner didn't know anything about it other than that it may be russian. It's certainly very old, it's beautiful and fascinating to look at. 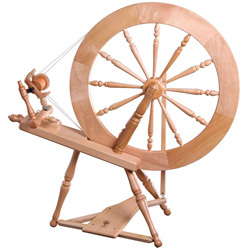 It is usable, I've put a drive band on it and successfully spun some wool, but it's not an everyday wheel. A decorative item which could be used for fun occasionally!